Old map by DE WIT - Nova Africa descriptio. Size: 17.3 x 21.9 inches. Condition: Printed on ply-paper. Paper slightly age-toned, more in the margins. Split of lower part center fold, 3cm. Into engraved area. In good condition. 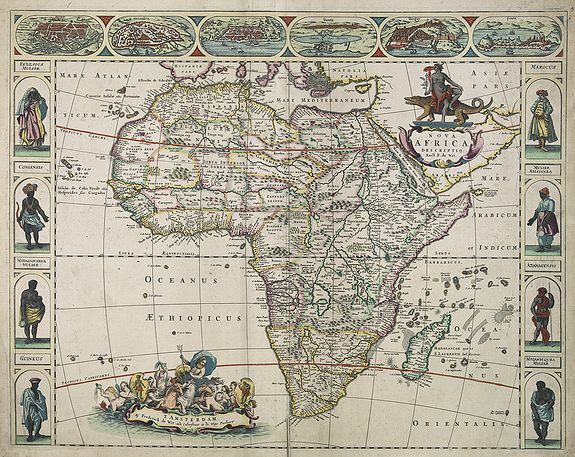 A beautifully engraved and most attractive "carte à figures"- map of the African continent. Bordered, above, by panels showing panorama's of Cairo, Alexandria, Algiers, Tunis, Tangier and Ceuta. Four panels on each side show figures in national costume. It was the last printed "carte à figures"- map in Amsterdam. This is the fourth state, without the "fo.3" in upper right corner. The allegorical title cartouche of an African woman sitting on a crocodile has been copied from N.Visscher' continent map.